And the Company Insider plugin displays in-depth, personalized insights from LinkedIn about companies featured on a site. For example, you can access a summary of who in a visitors’ network works at a given company, a list of new hires, and job changes. Developers can also embed the ability to follow a company within their sites. Other plugins include a recommend button, which allows users to promote a product on LinkedIn from a third-party site with a link back to the site. And LinkedIn also allows developers to embed a LinkedIn Share button on sites, which is similar to Twitter’s Tweet button and can feature share counts and more. more robust OAuth support. Additionally, LinkedIn has redesigned its Platform and API portal to make it easier for developers to access content and deploy plugins. 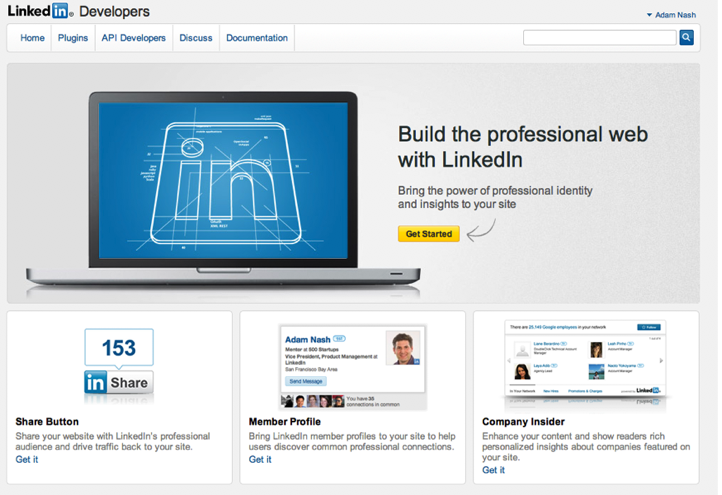 LinkedIn just crossed the 100 million member mark, and in order to continue to drive member and visitor growth the network is going to have to present developers with innovative ways to embed LinkedIn functionality on outside sites. Facebook and Twitter have both done this at a massive scale. Launching lightweight plugins that are easy for developers to embed is probably a wise way to spread LinkedIn across the web.